Riverside Public Schools is accepting applications for students wishing to participate in the School Choice Program. School Choice is a program authorized by the Arkansas General Assembly in The Public School Choice Act of 2015 that allows parents to apply for their child’s admission to participating school districts other than the one in which they reside. 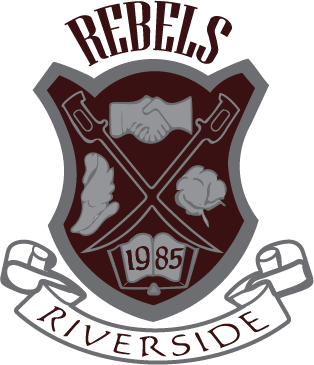 We believe that Riverside Public Schools are the best choice for your child's education. Riverside has many unique opportunities for students to achieve. Our R.E.A.D. (Rebels Earning Associates Degrees) program is available for our students to graduate with their high school diploma as well as an associates degree through our relationship with Arkansas State University-Newport, all without costing our students and families a penny. Class is just a click away with our 1:1 computer technology. Our students are able to use a Chromebook to stay connected to their classrooms to ensure they never miss an educational opportunity. In addition to these programs, Riverside students are able to take advantage of flex scheduling. Juniors and Seniors are able to choose a schedule that allows them to take the classes they need to graduate and explore other educational opportunities off campus. They can choose to come to school at 8:00 in the morning and leave around lunch or choose to come in around lunch and leave when school is out at 3:10. The Riverside Public School District will accept eligible students from other districts under the School Choice program during the 2018-19 School year. Application forms are available at the Administration office located at 2006 HWY 18, Suite C, Lake City, AR 72437. Applications must be completed on or before May 1, 2019. Applicants will be notified of their acceptance or rejection by July 1, 2019. Students who reside outside the state of Arkansas or who are currently expelled from school for a drug or weapon violation are not eligible for participation. Click the links below for information on the School Choice Act of 2015 and the School Choice Application.